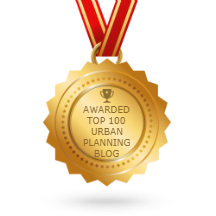 It should come as no surprise that most people in Egor are not happy – will this "fact"- i.e. that these areas are mapped, make any difference to the problems these people experience in their daily lives -or is this just another type of academic past time ? Children living in Phumlani Village, Cape Town, South Africa have no safe place to play. Safe playgrounds help promote community and educational development. Maybe thers someone here in Cape Town whos preppared to sponsor this? Wynwood é um bairro de Miami, até há algum tempo degradado, e agora totalmente revitalizado, com obras de street art dos mais famosos grafiteiros da cena internacional. Freehand drawing is as neccessasary now as it ever was – digital photos, computers, 3d graphics might have the day in recording annd rendering , but ideas and feelings and images of place are more readily encoded in us when we record them in in sketches – our observatiosn in allsenses are enriched by them. 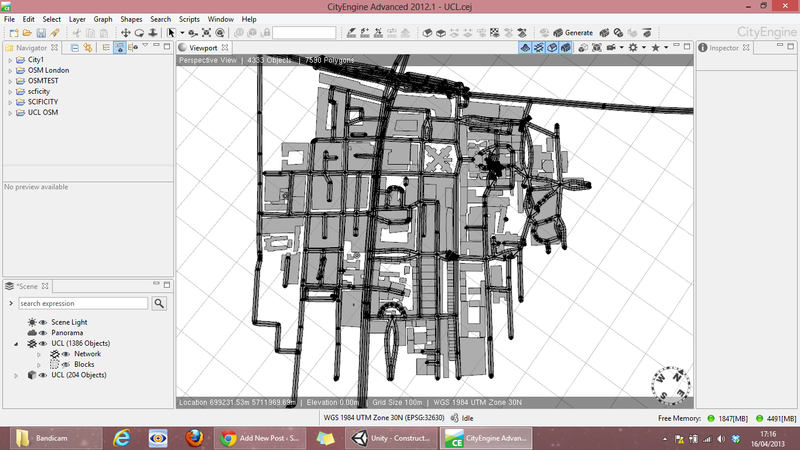 Chris Reed’s Stoss again an inspiratoinal design and different view of what streets can be. Just before my CityEngine month trial ends, I spent a couple of days of exploring CityEngine, I was able to create a set of simple models and export them through into Unity 3D. 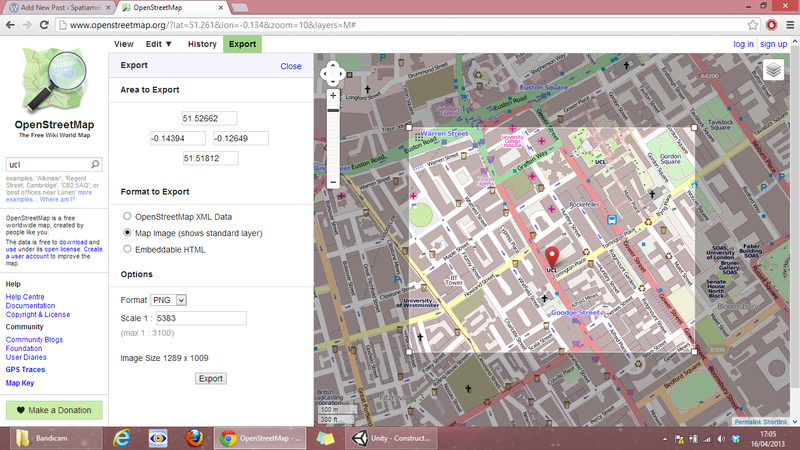 Initially I took a export of xml data from OpenStreetMap of an area around the UCL campus. 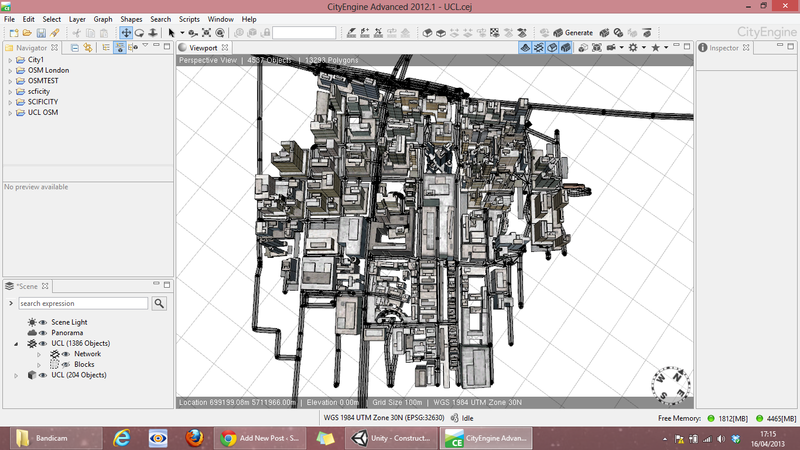 This was then fed into CityEngine using the import tool available specifically for OSM data. By selecting the various building models, they were exported out into FBX format which can be read into Unity 3D, the textures however had to be reconfigured and set in Unity. Then importing the Constructor asset we get an avatar to explore the simple 3D space created.